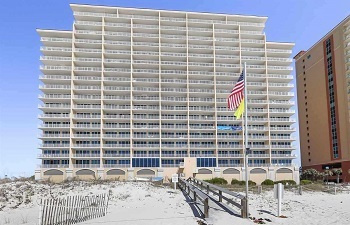 Gulf Shores AL beachfront condo for sale at San Carlos. 3 BR, 3 BA gulf front unit. It is located on the 9th floor in the indoor central lobby that is heated and cooled. The up scaled furnishings, accessories and bedspreads are brand new (June 2018). Spacious balcony allows fantastic views and sunsets. San Carlos is located in the center of Gulf Shores very close to shopping, nightlife, restaurants and everything the beach has to offer. Ac/heat system interior and exterior is a brand new carrier coastal series unit (installed July 2018)..come see this one today!